Apprising Ministries reminded you recently in Beth Moore Attacks The Protestant Reformation that both Moore and Priscilla Shirer were part of the Be Still…And Know That I Am God DVD, which is a veritable ode to a form of meditation in an altered state of consciousness known as Contemplative/Centering Prayer (CCP). 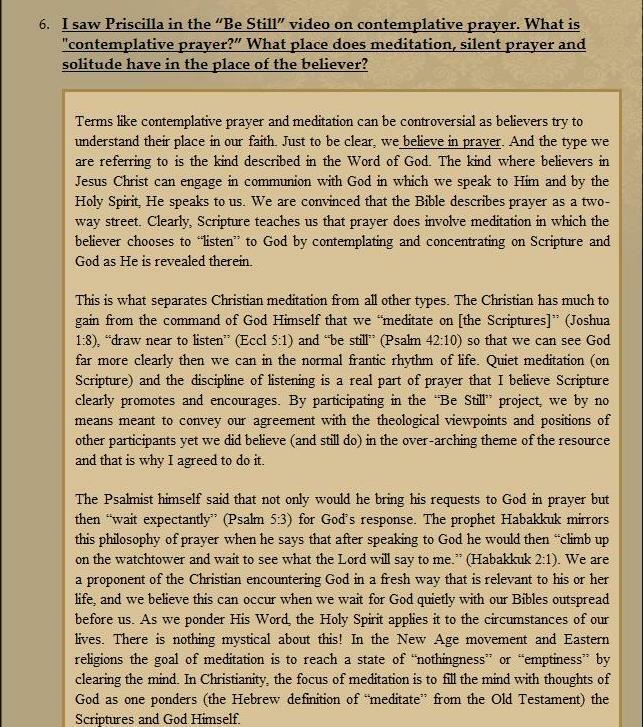 And as I’ve mentioned before, this so-called prayer is the very crown jewel of Contemplative Spirituality/Mysticism (CSM), which itself is actually a romaticized version of neo-Gnostic Roman Catholic mysticism. You probably know that this CSM is being promulgated throughout largely pretending to be Protestant evangelicalism under the guise of so-called Spiritual Formation e.g. that taught by Living Spiritual Teacher and Quaker mystic Richard Foster, along with his trusty spiritual twin, and Southern Baptist minister, Dallas Willard along to give this asceticism-lite neo-Pietism a thin veneer of scholastic respectability. contemplatives [such] as Richard Foster, Dallas Willard, Calvin Miller and Priscilla Shirer, along with some names that may surprise you? Max Lucado, Beth Moore. An acknowledgement list at the end includes Brennan Manning and Dr. Charles Stanley. 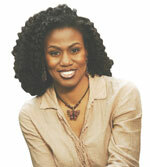 Priscilla Shirer is a BIBLE teacher. Through the expository teaching of the Word of God to women, her desires to see women not only know the uncompromising truths of Scripture intellectually but experience them practically by the power of the Holy Spirit. As soon as you hear someone claiming to teach in the Name of Jesus Christ use the term “go beyond” it should immediately arrest your attention. Go beyond, what; invariably it’s going beyond Scripture. Here’s the bottom line: In the Bible we know we hear God’s Voice; but as soon as we go beyond into “inner,” i.e highly subjective, experiences we then open a door that is leading so many today into the spiritual deception of this spurious CSM—the romanticized Counter Reformation spirituality of apostate (at best) Roman Catholic mystics—as taught e.g. by Foster and Willard. As someone whose background is Comparative Religion, for years now, I’ve studied meditation from primary sources from a whole variety of religious backgrounds. And in addition I’ve also been covering the rise of the sinfully ecumenical neo-liberal cult of the Emerging Church aka Emerging Church, which has CSM at the rotten core of its Liberalism 2.o “big tent” Progressive Christianity it’s now calling Emergence Christianity. So for this reason I’ve then had occasion to study the so-called “contemplative tradition” of Christianity from its own sources for the better part of five plus years now. Just to be clear, we believe in prayer. And the type we are referring to is the kind described in the Word of God. The kind where believers in Jesus Christ can engage in communion with God in which we speak to Him and by the Holy Spirit, He speaks to us. We are convinced that the Bible describes prayer as a two-way street. Clearly, Scripture teaches us that prayer does involve meditation in which the believer chooses to “listen” to God by contemplating and concentrating on Scripture and God as He is revealed therein. I have no reason to doubt that Priscilla Shirer et al believe prayer is important; however, that said, nowhere in Scripture do we find contemplative prayer taught, such as promulgated in that “Be Still project.” As far as the quote of the Scripture “Be still,” and I believe they mean Psalm 46:10, as you’ll see in Does Psalm 46:10 Teach Contemplative/Centering Prayer?, the answer is: No, it doesn’t. Mystics always point to that verse, ripping it from its context, as a proof-text for their transcendental-lite meditation CCP; but in context God is telling us not to strive with Him, but rather, to trust Him. We’re then told about the Lord’s command for “[q]uiet mediation” upon Scripture”; and as pastor, I personally encourage those in my local church to do just that because it is a means of grace ordained by God. However CCP, and some supposed “discipline of listening” while doing so, is not; no matter how much Priscilla Shirer and others may “believe” the Bible “clearly promotes and encourages” such things. 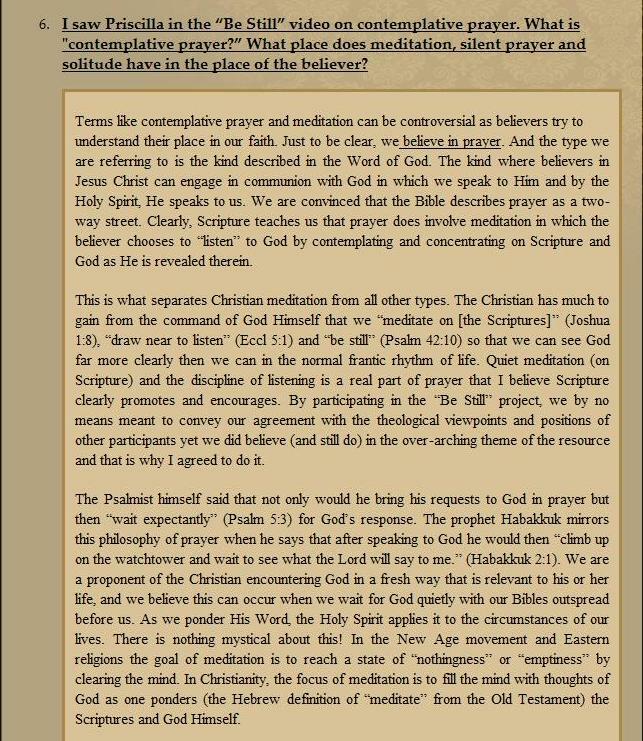 And despite the disclaimer that they didn’t mean “to convey” agreement, it’s simply beyond question the Be Still project was openly advocating contemplative prayer; to be in it was to promote CCP. Lord willing, another time we’ll deal further with the mystics mentioned above; suffice here to note the Be Still DVD has an entire section on the Contemplative Figures Throughout History, where they are presented as positive examples of “prayer.” Next we’re informed that Shirer’s “a proponent of the Christian encountering God in a fresh way that is relevant to his or her life,” whatever that is. Shirer’s ministry then tells us that it believes “this can occur when we wait for God quietly with our Bibles outspread before us. As we ponder His Word, the Holy Spirit applies it to the circumstances of our lives”. In the New Age movement and Eastern religions the goal of meditation is to reach a state of “nothingness” or “emptiness” by clearing the mind. In Christianity, the focus of meditation is to fill the mind with thoughts of God as one ponders (the Hebrew definition of “meditate” from the Old Testament) the Scriptures and God Himself. The approach of New Age and Eastern meditation is somewhat different than the Christian version, which was adapted from Eastern religions because they are pantheistic (all is God); however, the goal of “transformation” remains the same. You need to understand “the disciplines of solitude and silence” refer to the mystic practice of meditation in an altered state of consciousness; it doesn’t simply mean to go somewhere alone and sit without saying any words. That’s just the pretending to be Protestant make-over CCP, which CSM advocates also refer to as “wordless prayer,” has been given in recent years. Although Jesus did spend time alone, meditation in an altered state of consciousness was not part of the Judaism of His day; He didn’t practice it or teach it. We can learn this from the Scripture itself; in fact, Luke tells us that one time Jesus was praying in a certain place, and when he finished, one of his disciples said to him, “Lord, teach us to pray, as John taught his disciples” (Luke 11:1). Note carefully what the inspired text tells us next: And he said to them, “When you pray, say” (Luke 11:2). If wordless CCP was as important as CSM proponents say it is, here was the perfect place for Jesus to teach it. Notice, however, that the Master did not; and as a result, neither did His Apostles. Colour 2010 GUEST SPEAKER Priscilla Shirer from Hillsong Church on Vimeo. I cover this in more depth in Origin Of Contemplative/Centering Prayer.